Window Cleaning magazine is a digital magazine that presents information and news articles aimed at the professional window cleaner. Subscription to the magazine is free and it’s packed with useful tips and advice on how to run a successful window cleaning business, plus information that can help window cleaners find new customers and build a sustainable recession proof business. The Window Cleaner Directory is the most comprehensive directory of window cleaners in the UK. Their website is designed to help you quickly find a window cleaner that covers your local area. Full details about the type of services each company offers accompany every listing. Advertising is free for window cleaners who want to their service. 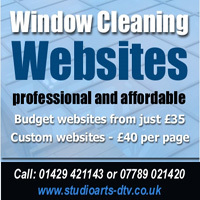 Studio Arts is a small business web design company based in the North-East who specialise in designing and promoting window cleaning websites and have many established clients in the window cleaning industry. Design fees range from zero cost for specially designed 3 page template based websites, when taken with their small business web hosting service. For more features they also offer ‘Premium’ websites and custom built websites. They also provide a very affordable SEO service as well to make sure your websiteappears high in the search results. The Window Cleaning Resources website provides information, tips and articles that are helpful to window cleaners. Whether you use traditional window cleaning methods or the latest water fed pole systems, on their website you’ll find lots of free advice and a number of useful resources that will be of interest. If you’re thinking of starting a window cleaning business or looking to expand your work then the Window Cleaning Rounds for Sale website is the first place to look. Also, if you want to sell your window cleaning round this is the ideal place. With hundreds of daily visitors it’s a great place to advertise your round and iformation is updated regularly so there’s always something of interest.